I really lucked out several months ago when my mother in law forwarded me an email with an incredible deal on Christmas photo cards. I was able to create my card quickly and easily online, but the best part was the price - it was just over $3 for 20 photo cards and envelopes with free shipping! It was awesome to mark one thing off my Christmas to do list so early, and at such a low price. For the front of the card, I used a favorite photo taken last year during a snowstorm (it's also the new blog header photo). The back of the card was left blank for writing a personal message to the recipient. Prints of this photo are for sale in my Etsy shop as well. Use the code "BLOG5" to get $5 off any order over $25! I was very pleased with how the cards turned out and can't wait to get them all mailed off. Do you create personalized Christmas cards each year? PS - Here's our 2012 Christmas card. PPS - Don't forget to visit Daisy, Staci and Sue today for their posts in the Homemade Living series. Next week I will share my post along with Mary and Jackie. Lovely Winter scene!! Yes!! What a deal that you got!! Already have mine ordered - but will have to remember for next year! Nice photo! I'll bet its a good feeling to have that taken care of already. I too send out photo Christmas cards, but the photo is always of my family (my kids hate the annual "getting the family photo" tradition!) Luckily, this year I already had a family photo, the one from my daughter's graduation. We send a Christmas card too. This year we created our own little message too. I send a letter to the folks we do not see often to keep them posted on how we are. So beautiful! Your pictures are always so lovely. I feel as though I could just walk into this photo. Tammy, it's absolutely beautiful. You picked the right photo ... it's stunning! Every card of any kind I make myself, drawing the picture. Sometimes I make my own stamps too and put them on in addtion to the postage stamps (they let you do that, which surprised me). LOVE THIS! What a beautiful card Tammy - great work, as always! You really captured Christmas! Love your card.. It is beautiful.. I wish I had of thought of doing this..
That is so beautiful Tammy! You are so talented! I was hoping to have our own photo cards this year, but tomorrow is my last chance to make it happen. Maybe.... Just maybe...! That is a great photo. I do a photo card each year. Usually a collage of farm and family pictures. That is a great deal. What a beautiful shot! What a beautiful snow scene and card you created and the price is right too. This is my first visit here and I am happy to meet you. I buy our cards but love the photo cards. That card just screams Christmas. Nice work! It did turn out perfect! That is definitely a card worthy picture...I have not sent out one card yet... I guess I am way behind.....Blessings! That picture belongs on the front of a Christmas card for sure!! So pretty! Only sending out a few cards this Christmas season. I love it! And I do.. 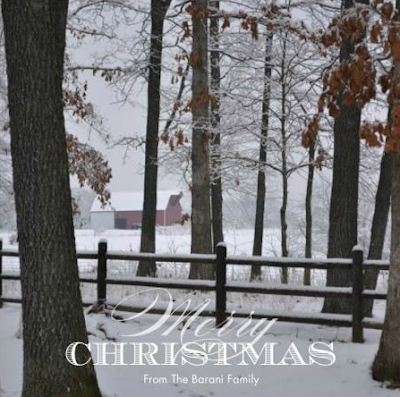 I write a Christmas letter & create a photo greeting every year. And I love doing it. :) Although I'm always running behind! I plan to get ours' ready & off by next week. I really love your header and the Christmas card. It is a beautiful winter scene! Have a great day, Tammy! Oh that's a gorgeous scene for a Christmas card! Most years I don't make my own cards...I just mail out too many and it would be so expensive. But one of these days I am going to try it! Just a quick drop in to say that your rosemary olive oil cake is part of my edible Christmas gift guide. I love your card! It is very wintery and will make a great Christmas card. We do picture cards as well for most people. Some people just get a generic card purchased at the big box store. I was really late in ordering cards this year and they won't arrive until MO so it will be a rush to get them in the mail before they turn into New Years cards! This is a lovely Christmas card! What a beautiful Christmas card and what a deal you made. I did print out my own Christmas cards of our trailer in the snow when we where in Idaho. I made them into postcards. But they cost me a lot more.. I hope you having a happy week so far. Beautiful card! I just sent all of mine out - wish I thought to make personalised ones. Nice. That is a deal. I am sure everyone who gets them will just love it. oh wow, what a steal and that card is gorgeous! !